Video Recipe - When using puff pastry you often have leftovers. 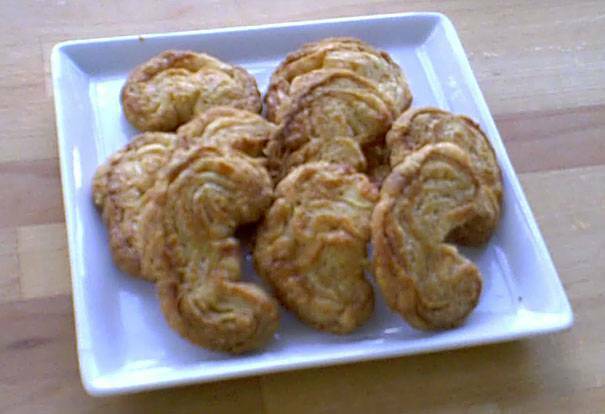 Instead of throwing them out, you can make Palmiers. Small cute palm leaves. And yes. It's worth the effort. You could probably buy half a sack full in the supermarket for no money, but they will not be made ​​with butter. Sprinkle icing sugar on the table, just as you normally would sprinkle flour when you knead bread. Collect all your puff pastry leftovers and roll it out until it is approximately ½ cm (1/4 inch) thick - and 20-30 cm (10 inches) long. Get plenty of icing sugar both sides of the puff pastry. Gather the ends of the pastry so they meet in the middle. Pick up the new ends so they meet in the middle too. Now you have a thick roll/sausage with eight layers of puff pastry. Put the slices on a baking sheet. Bake in 200°C (400°F) oven for 15-20 minutes. Keep a close eye on them at the end. They brown suddenly.